A vengeful woman who poured scalding hot water over her husband in their Peterborough home has had her bid for freedom thwarted by top judges. Teresa Gilbertson, 60, attacked Kenneth Gregory, then 65, with the boiling hot liquid after the couple rowed about getting divorced. The former special constable was living in Raeburn Road, Hayes, Middlesex, when sentenced to four years at Peterborough Crown Court on March 24. She was found guilty of causing grievous bodily harm with intent. Today top judges at London’s Criminal Court of Appeal rejected her bid to challenge her conviction. Mr Justice William Davis told the court how Gilbertson, who had no previous convictions, married Mr Gregory in 2010. But their marriage was ‘not a happy one’ and they were talking about the possibility of divorce. The judge said this was in part due to Gilbertson ‘believing that she was treated by her husband as little more than a live-in maid or housekeeper’. They also argued about money, the court heard. In February last year, Gilbertson spilt hot tea on Mr Gregory’s head when he was in bed, causing minor burns to his eye. She insisted ‘it was an accident’. On March 23 last year, the couple were at home in their Peterborough bungalow. They had already had an argument where divorce was again mentioned, the judge said. Mr Gregory was at his computer when his wife came into the room carrying a two-litre jug of recently boiled water. She poured the scalding hot water over his head and it ran down his back. Mr Gregory said his wife remarked ‘there you are’ and didn’t help him, instead just standing there and looking at him. He had to call an ambulance himself and was left with serious burns to his head, shoulders and back from the 50 to 70 centigrade water. Roger Harrison, for Gilbertson, applied for leave to appeal against conviction today. She claimed during her trial that she was standing behind her husband when he was on the computer and he ‘hit out with his arm’. That, she alleged, knocked her off balance and the water spilt out of the jug as she span round. Mr Harrison, argued that a prosecution expert in the case had not been able to discount the possibility that her account of what happened was correct. But Mr Justice William Davis said the expert’s assessment was that the injuries ‘were wholly consistent’ with Mr Gregory’s account. Gilbertson’s story was, he said, ‘difficult to reconcile’ with the burns he suffered. Mr Harrison said Gilbertson was left with a ‘lump on the head’ after the incident and police had failed to examine that. But Mr Justice Davis said the lump would not have ‘established her innocence’. It would have supported her case ‘but no more than that’. The judge, sitting with Lord Justice Davis (correct) and Judge Nicholas Cooke QC, said they were ‘satisfied that the matters raised in this application give rise to no arguable appeal’. “She had a jug of scalding hot water in a room where she had no need for a jug of scalding hot water,” he said. She did not apologise or try to assist him and the attack happened ‘against a background of animosity between the two’ and the similar incident with the cup of tea. 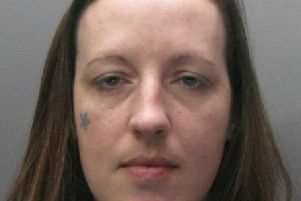 The judge said the jury was ‘wholly entitled to convict’ Gilbertson and there was nothing ‘unsafe’ about her conviction.